Familiar to all fans of the Blues Brothers film this set of figures captures two icons of film and music. 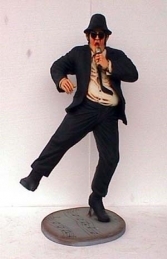 These statues are fantastic for music bars, themed areas and parties. These two dancing figures dressed in black suits and dark glasses capture the likenesses of Jake and Elwood from the Blues Brothers film. The figures are shown here as a pair but can be sold seperately (Jake =JR 745A & Elwood=JR745B at £299 each) and the models area also available in a 3ft version (JR 816). 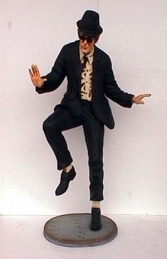 This pair life-size 3d cold-cast poly-resin & fibre-glass figures of the dancing Blues Brothers is ideal for music, entertainment and Hollywood themes, Movie and film displays, advertising or drawing attention to your business or for the home and garden. PLEASE CONTACT US ON 01626 833646 or 07860 680181 TO DISCUSS THESE MODELS & THE OTHERS IN OUR HOLLYWOOD & ENTERTAINMENT SERIES. PLEASE PHONE US TO PLACE AN ORDER & FOR A QUOTE FOR DELIVERY COST TO YOUR POSTCODE.